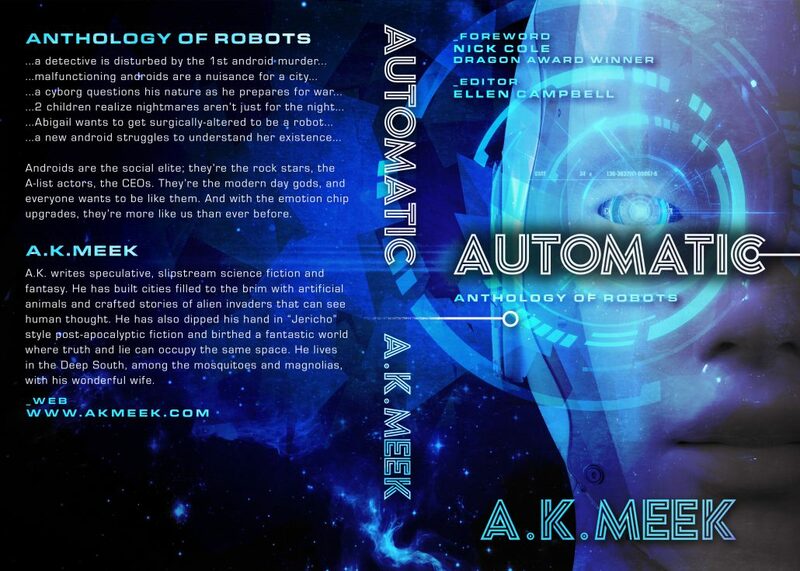 As I began to create the paperback version of my anthology of android stories, Automatic, I decided to reboot the cover. What does this mean? Well, it means I wanted to putz around in Photoshop and needed an excuse. I also wanted to establish a visual language to use throughout the book. What’s a visual language? Glad you asked. A visual language is a set of graphics (including alphabetic glyphs, typefaces) used to convey meaning. I’m using visual language in the graphic design context; to tie elements of a design together, creating one cohesive design product. Color. The first I established a foundation through hues of blue. I probably won’t use color for any internal pages of the paperback, but it will be used in graphics created for online promos. Typeface. I downloaded an awesome typeface, Argon, which has a liberal license to use in products for resell. It’s unique and adds dynamic visuals. I used it for the title and my name on the cover. The other typeface used is Eurostile Extended, which is a great sci-fi typeface used in movies such as Alien and 2001. Did you notice the little circle and line on the cover? I hope it reminded you of circuit board schematics or wiring diagrams. It’s a subtle reminder of technology, computers, androids. It’s also a great visual element that will be carried throughout the paperback. Glowy “tech” circles and stuff. I created these with various Photoshop brushes, and I can pull any of them as design elements to be used throughout the paperback. Once I complete the paperback I hope it will rock as much as I think the new cover rocks. Check out the wraparound cover. It turned out o.k. If you haven’t picked up an ebook copy of this yet, head over to Amazon and grab a copy for only $2.99. It’s in Kindle Unlimited too, if you subscribe to that.